Head over to Save.ca to find the mailable coupon for a free box of protein bars. 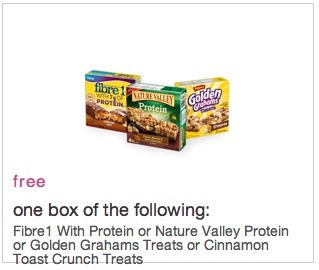 You can choose one free box of the following: Fibre 1 with 6g/7g of Protein (132g), or Nature Valley Protein (148g) or Golden Grahams Treats (125g), or Cinnamon Toast Crunch Treats (120g). This coupon is valid for one day only – July 23, 2013.